Lonza, a leading global supplier in the life sciences sector, is already an important tenant in the Stücki Park. The company occupies both office and laboratory space on the existing site. Swiss Prime Site Immobilien is building additional spaces for the pharmaceutical and life sciences industry alongside the long building (Hochbergerstrasse 60 A to E). Four buildings will be erected in two construction phases, with seven and eight floors respectively. From the third quarter of 2020, Lonza Drug Product Services will occupy an entire building in this new development, comprising around 8 000 m2. Prof. Hanns-Christian Mahler, Head of Lonza Drug Product Services, commented: «As we continue to grow in Drug Product Services, the new buildings at Stücki Park are ideal for us. In the new 60 G building, we will be able to provide our specialists with another 250 work stations, thus further enhancing Basel as a major economic area». The development of the Stücki Park complex is progressing according to plan. Swiss Prime Site Immobilien is significantly expanding the site with investment of CHF 190 million. The expansion of the existing laboratory and office space will be carried out in two phases, doubling the rental area by some 33 000 m2 to over 60 000 m2 by 2023. 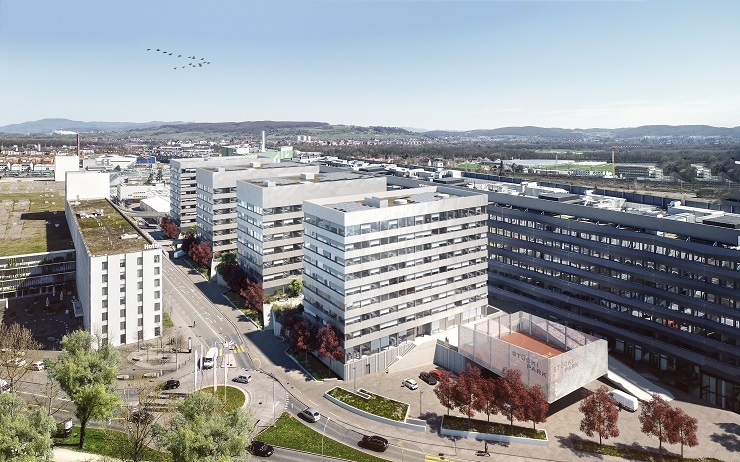 Consequently, Swiss Prime Site Immobilien is able to meet the region’s needs for laboratory and office space and create an additional 1 700 work stations. The project will unite knowledge, innovation, experience and retail in an urban centre – a true melting pot that will impact the whole Basel region. Peter Lehmann, CEO of Swiss Prime Site Immobilien, commented: «We are delighted that our project is able to meet the additional space requirements of one of our anchor tenants in Stücki Park. The complete rental of the existing long building and a substantial part of the new building represents a significant milestone for the site, which this project will make considerably more attractive». Swiss Prime Site Immobilien AG is a group company of the listed Swiss Prime Site AG. Its current property portfolio is worth over CHF 11 billion. Swiss Prime Site Immobilien invests in high-quality real estate in prime locations in Switzerland. These properties are mainly used by commercial tenants. The conversion, development and modernisation of entire areas constitutes another important pillar of this business segment. THIS PRESS RELEASE IS NOT BEING ISSUED IN THE UNITED STATES OF AMERICA AND SHOULD NOT BE DISTRIBUTED TO UNITED STATES PERSONS OR PUBLICATIONS WITH A GENERAL CIRCULATION IN THE UNITED STATES. THIS DOCUMENT DOES NOT CONSTITUTE AN OFFER OR INVITATION TO SUBSCRIBE FOR OR PURCHASE ANY SECURITIES. IN ADDITION, THE SECURITIES OF SWISS PRIME SITE AG HAVE NOT BEEN REGISTERED UNDER THE UNITED STATES SECURITIES LAWS AND MAY NOT BE OFFERED, SOLD OR DELIVERED WITHIN THE UNITED STATES OR TO U.S. PERSONS ABSENT FROM REGISTRATION UNDER OR AN APPLICABLE EXEMPTION FROM THE REGISTRATION REQUIREMENTS OF THE UNITED STATES SECURITIES LAWS.